To be brutally honest, no one (and that includes me as well) genuinely knows what is the best way to distribute an Indian Indie in India. The revival of Indian Independent film industry has just started and it is currently in a very nascent stage. We all are experimenting and trying to identify the best case scenario factoring all the constraints (read quality of the film, limited appeal, limited marketing budget and resources etc). There is no one single formula applicable for all Indies and each film requires a customized plan. While owning theatres/ screens (like in case of PVR) helps a bit to screen indie content; other distributor(non cinema owners) mostly rely on relationships built over years with programmers and cinema chains to be able to screen indies. Whenever an indie releases we see people starting endless debates on the social media platforms with respect to shows, show-timings, ticket prices etc. In order to make the most out of these debates it is of pivotal importance to first have our basics right. 1. So who actually decides how many shows to be allocated to an indie and in which theatres? For an indie releasing on a Friday, on the preceding Monday the distributor send show requests (wish list in terms of cities, theatres, number of shows, show timings) to the programming teams of various cinema chains. The concerned programming teams then works out a tentative showcasing plan based on factors like the number of films releasing on that particular Friday, performance of last week releases, expected target audience of the film, past performance of similar indies etc. This tentative schedule is then shared with Cinema Operations Team for final approval. Cinema Operations – Each theatre is managed by a cinema manager who has a target to achieve in terms of number of admits, ATP (average ticket price), SPH (sales per head) – a daily target, weekly target, monthly target, quarterly target and annual target. The career of a cinema manager is directly proportional to these targets and hence all his/her efforts are focused on optimizing the same. Statistics show that the performance of Indian Indies is abysmally poor in all the three parameters – admits, ATP and SPH and hence not many cinema managers are keen on showcasing Indies at his/her property. So if we want Indies to be released in as many theatres as possible, we need to make the people who run the cinemas confident about the product and this is possible only when a few Indies start performing. So we come to the next big question on ticket pricing. 2. How is ticket pricing decided? Every cinema has to operate within price bands pre-approved by the government and no theatre can sell tickets below the lowest price band. The best thing an indie distributor can do is to request the respective cinemas to run the film on the lowest price band and it’s at the discretion of the individual cinemas/ Operations to agree to the request or not. In addition to the above there is a regular pricing and a blockbuster pricing. Blockbuster pricing is applicable during weeks of tentpole/ big releases and in case an indie is releasing in a week with a tentpole film, blockbuster pricing is applicable to the indie as well in most cases. We are trying to work out a special discounted price band for Indies released through Director’s Rare. Another solution can be government waiving off the E.Tax for Indies but for that we need clear cut guidelines to define a film as an independent film. 3. At PVR Director’s Cut, Vasant Kunj, Delhi, the ticket price of an Indie is above Rs. 1000. Why? First of all I would like to clarify that PVR Director’s Cut and PVR Director’s Rare are 2 different things. PVR Director’s Cut is a super luxury premium theatre located at Vasant Kunj, New Delhi where as PVR Director’s Rare is a banner for theatrical distribution/ showcasing of niche content. Director’s Cut being a premium theatre, not only Indies but every film is at a premium price. This is like the Business class of an airline and we have a dedicated clientele for this property. Now the question is if Director’s Cut is a premium property, what is the point of releasing an Indie there? There are a few reasons for the same. First it has always been a struggle to get screens for an Indie in Delhi as most of the multiplexes in Delhi have 3-5 screens which is not enough when compared to the number of films releasing in a particular week unlike that in Mumbai, Bangalore, Pune etc. In PVR Director’s Cut, there is one dedicated auditorium for showing alternate content and hence we always get a show there. And I have always believed that it is better to release the film in Director’s Cut rather than not releasing the film in Delhi at all. In most of the cases we release the film simultaneously in PVR MGF Mall/ PVR Ambience Mall etc, which are regular priced cinemas. Also if we analyze the total box office earnings of an indie in most cases (not all), a major percentage of the collections is from PVR Director’s Cut. This is because the producer’s earnings on a ticket of Director’s Cut after tax are almost 3-4 times as compared to a regular cinema. 4. 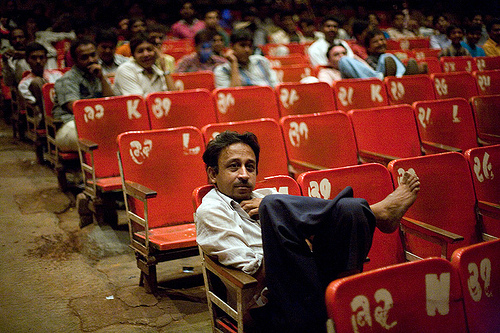 In Delhi, the spread of theatres for Indies are mostly limited to South Delhi. Why is this so? We have to understand one thing that when a film is released, there is a cost attached to it. For releasing a film in one show in one theatre, the total expense on content comes to around INR 18000 per property per week ( INR 14000 Virtual print fee + 12.3% tax + INR 2000 for cloning and cargo). For a producer to recover this cost on content, we need net box office sale of close to INR 40-45000 for that particular property. So as of now it is really not a very good decision to release such niche content in theatres other than in South Delhi. May be in future once the market matures, we will be able to spread the reach all over Delhi NCR. All said and done we must rejoice on the fact that this is perhaps one of the best phases to be in for an Indian Indie filmmaker and the future will be better. A few observations/ suggestions which may be useful for aspiring Independent filmmakers. Make a kickass Indie. There is no substitute to that. No amount of support, gyaan, strategy, patronizing, social media buzz can save a bad/mediocre indie. Do not compare with Rowdy Rathores of the world because that industry works on a completely different dynamics. When you are planning an indie, in case you do not have access to marketing and distribution budget of around INR 1.5-2 crores, the production cost of your indie should not exceed a few lakhs at any cost. But is it possible to make a good film with such minimal amount? Read about Karan Gour’s KSHAY, which I consider as a classic case study of a successful Indian Indie. Do not try to do everything yourself. Not every one of us is a Robert Rodriguez. I know we have budget constraints but it is always better to rope in professionals wherever possible and do pay them a fee (whatever best you can afford). Know your weak spots. For e.g if you are not very good at writing, it is always advisable to hire a screen writer to write the screenplay for you. You will find many talented screenwriters willing to help you out. Roping in professionals will definitely help in raising the quality of the final output. Once you have made a good film, invest some money in hiring a good intelligent publicist who will help with creating the much required aura around the film. Rope in a good designer and get some good artwork ready. Invest in a professional promo editor. These are few small things but if done properly will go a long way in packaging the film well which in turn may yield better results during distribution phase. My qusetion for Shiladitya Sir. 1. PVR is not only the distributor but also the exhibitor? Now since their is a vertical integration involved does not it become easier for them to cut down upon the ticket pricing? 2. in the recent ‘Save Indie’ campaign led by director Onir, why did not corporates join in to bring more visibility to the movement. I am sure it would have made the campaign more structured and basic questions like “how does one decide which film can be called an Indie” would have definitely got answered, esp when exhibition of indies was one of the point of concerns in the campaign! 3. Assuming it is a sustainable business model for PVR and not just a CSR activity, why isn’t a disruptive method adopted after thorough market research on Price Elasticity for Indies/ Shorts/ Small Budget regional Films. I am sure this must have been thought of by the company. Finding out the “right price” through extensive customer/ consumer survey would help us arrive at a more sustainable model. Looking forward to your answers on this forum. 1. As I have already mentioned the final say in such matters is of Cinema Operations Team. Although the parent company is same each vertical operates as independent entities but we are seriously considering introducing a flat discounted price band to increase the audence base and be able to control prce fluctuatons. 2. The petition asked for reserving one audi at multiplexes for Indie films which is not a feasible thing. There is a mismatch between demand and supply and to be frank not enough Indie content deserving a theatrical release is available. And I am personally against any kind of reservation as it will be detrimental to the quality quotient. Also please refer to my previous post on this blog w.r.t the petition. 3. I must accept that we have not done this. This is a very good and valuable suggestion and we will surely implement it and will do an extensive consumer survey. Sincere thanks. Shiladitya as i already told you through many platforms that i believe PVR directors rare is doing excellent job. And i am yet to change the opinion. But we independent filmmakers have very strong expectations, which may be sometimes are unreasonable. Anyways there is always price and sales conundrum. Every business try to optimize the revenue at different price point. Assuming all constant factor … Now a indie filmmaker see that his films reached only 4,000 people out of possible 9,000 while the theater managers will see that he could most of the business at Rs 400. It is always the same. While filmmakers wants maximum number of audience, producers/distributors will always want better returns. Now my point and worry is if optimal price point is 400 Rs and audience is 4000 people and PVR directors sole attempt is to maximize the revenue, the future of indie films in india will be depend on those 4,000 people and most importantly their TASTE. Now one can make any kind of assumption what their taste could be, but whatever the taste may be. There will be also be methods to attract that audience, since we know them to high paying class audience. And then the future indie films will be made for high paying, class audience, with certain sensibilities and taste. Because those are the kind of films a theater Manager will demand. And that is my worry that here we are stereotyping the indie films. Now tell me how it is better or worse than stereotyped mass oriented bollywood. Instead I think PVR Rare should also look at the middle way of increasing the number of audience, that is trying to bring new audience to watch a indie films in the theater and at the same time maintain a certain profitability. It will take indie films to the masses, may be slowly. But i am sure if price point is at 400 there will be only a certain kind of indie cinema. On other hand it is middle path cinema of Ramu and Anurag, dibakar and so many, which made content priority in bollywood today and now content driven films are making money. I can understand your desire to show that indie film can make money, but it is more number of audience which will make it sustain in longer run … of course provided that good content keeps coming. I completely buy your point and thats why we have started experimenting with pricing. Of late wherever possible we are trying to make it affordable for eg in Ahmedabad tickets are priced around 90, in Goregaon around 110, in Andheri 100, in Bangalore around 110 and similarly in other cities. We have realised one thing that the only way to succeed is by being able to increase the audience base. From around 1500 admits in our first film today we have reached a stage that for a decently successful release we are able to get around 11-12000 admits which surely is a huge jump. Hi … Watched Shorts on 13th July (4 rows full) and Ship of Theseus on 20th July (seemed like only 10% vacant seats) in PVR Pune … tickets for both were 350 bucks … for prime category … while i really liked both the films , i do feel the prices were a rip off !!! 2) highest prices in Pune for blockbusters on Saturday night rarely goes beyond 300 bucks. So the audience which could have been at least tempted to see an indie , is ruled out. 3) In Pune , its the entry of PVR which has pushed up prices of other multiplexes with no increase in facilities. 4) Director’s Rare is a PVR venture and i am sure you guys want it to be exclusive to PVR, but if the operational costs of Director’s Rare in PVR Pune is high , so as to warrant the prices … reaching out to another theatre (may not be a competing chain like Inox but a independent multiplex like E Square) , may help you reach out to a larger audience and still keep prices affordable. why cant we have a no-frills arrangement – 50-100 seater, no-parking, basic AC/ seats but good screen/ sound – dedicated only for Indie movies. Its high time we had one..
Is it possible to come up with a plan where you ask the viewers to pay for the tickets ( a reasonable amount like Rs. 150 or lesser) in advance for an indie movie and when sufficient tickets are sold, you announce a a venue, date and timing. If you don’t find enough viewers , you can return the money. a very layman approach of mine says that business at the end of day only caters to the demand,ok it can be manipulative to some xtent in creating the demand but on a more raw and basic ground it just caters it……so audience is the thing which needs to change and not the price…..agar kam pay karne waali audience hogi jo indie dekhna chaahti ho toh price will find its way on its own….tab tak ke liye i share the concern of chhatrapal of indies getting stereotyped and the gap from the mass audience of it increasing by the day……..